Calm and gentle with gorgeous solid wood slats and graceful curves at each end, the Amish Manhattan Convertible Crib is sturdy solid wood sculpted to perfection. The Manhattan converts to a toddler day bed and adult full bed, capable of supporting your child with a great night's sleep as he or she grows. The Manhattan design is luxurious and well made, providing the best for infant years and beyond. Save money and enjoy exquisite style and features with Amish children's furniture. 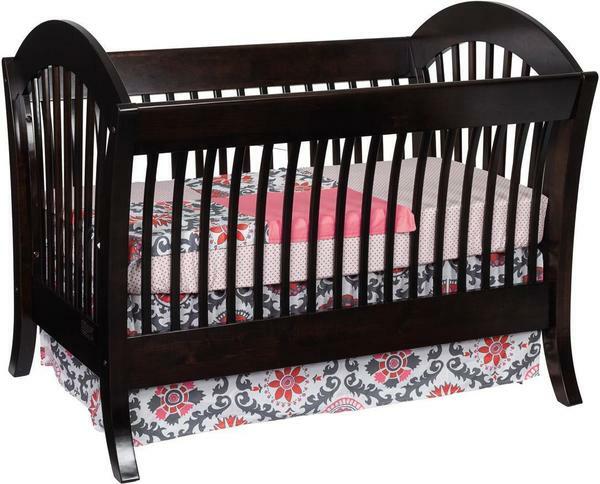 This solid wood crib features mortise and tenon construction that will create the strongest joints to outperform the rest. The finish is formaldehyde free and safe for your baby. Fasteners are hidden and will not create any rough surfaces. The thick flared posts are signature of Amish craftsmanship. Amish furniture is built to be stronger, more functional and utterly beautiful.